"Then you got anthropomorphic bottles in business attire, a painting of a nun that can whip out a huge tongue, and a towering sumo wrestler chilling beside Mount Fuji. Seriously, how do you pitch a game like this?" If you're expecting to play a good beat'em up, PuLiRuLa will do nothing but waste your time. Except for the bosses and a very small set of enemy types that hardly show up, the game provides an absurdly simplistic experience by allowing the majority of opponents to be defeated in just one hit. The developers supposedly "counter" this issue by throwing three to four enemies on screen at once. The problem with this is attacks are easy to dodge due to predictable movements, with only a rare few catching you off-guard with sudden appearances. For something that lasts 25 to 30 minutes, the act of playing PuLiRuLa feels like work thanks to the lack of any challenge or fun beating up foes. The most alarming and hilarious thing about this particular release is how you're given an additional booklet. A strategy guide, to be specific. I feel as if they did this as a joke... it has to be. So why, then, does this title occasionally get brought up in discussions about beat'em ups that need to be experienced? Because PuLiRuLa is such a weird game. Not in a Funny-HaHa manner, either, but in a Porky Pig in Wackyland way. The story involves the plight of two kids that must recover wind-up keys that were stolen by a bird man with a wooden puppet. Without said keys, time comes to a standstill in Radishland, and the only reason they're still moving is due to their magic sticks given by an old man. Interestingly, once you defeat the puppeteer in the first stage, he's revealed to actually be a parrot controlled by the wooden being. Already sounding strange? This is probably the tamest part of the game. The unusually proportioned and rough cartoony graphics help set the tone by giving off a bizarre look, as you'll encounter some of the oddest set of characters in a video game. I don't think I can give accurate descriptions to them, because I don't even know what the hell some of them are! But I'll try... 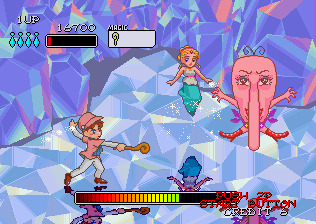 Walk up an icy mountain , and you'll be attacked by floating jelly fish with mustaches and small skating flamingos. Once you make it to the top, however, you'll quickly fall to the bottom where a boss awaits: a giant bald person with a floppy nose and handkerchief being supported by two legs. 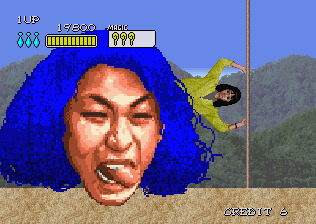 The following stage steps up the insanity by having an actual face with a blue wig fly into the screen as a woman acts like a flag on a pole in the background. That's how the stage begins. Seconds later, you'll witness enormous legs coming out from two doors, the middle door revealing a pink elephant and the planet Earth when hit. Then you got anthropomorphic bottles in business attire, a painting of a nun that can whip out a huge tongue, and a towering sumo wrestler chilling beside Mount Fuji. Seriously, how do you pitch a game like this? 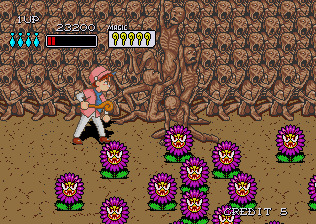 PuLiRuLa, amazingly, becomes even more surreal as you fight a mutant snail with preying mantis legs in the desert, find a bed of evil flowers set in front of a group of malnourished men, and walk through a level with backgrounds inspired by M.C. Escher paintings. But the gameplay, man. The gameplay! The play mechanics are downright boring, ensuring you'll only get a genuinely organic experience when you go through this the first time. While the game is beyond crazy, PuLiRuLa immediately becomes a chore to play on repeat ventures. Purchasing this Japan-only release for your Sega Saturn is hardly worth the mind trip, however if you're the type that wants to show it off to company, keep in mind there is an arcade version with Engrish text which you can play through "easy means". 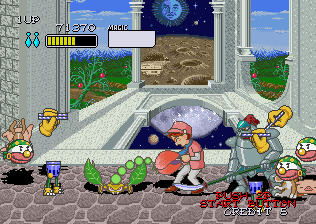 The only omission to this world edition is the exclusion of the giant legs, so unless you really want to see those, the original arcade game is the only version "worth" checking out. If you enjoyed this Pu-Li-Ru-La review, you're encouraged to discuss it with the author and with other members of the site's community. If you don't already have an HonestGamers account, you can sign up for one in a snap. Thank you for reading! Good use of the zany scenery to point out how un-enjoyable the game really is. I liked this review. One criticism... I really want you to go out and insert some pictures into the review. I think they are needed for something you've described as so bizarre. I normally don't like inserting pictures into my reviews, but you're right, this is one of the few times they're needed. Added some. Thanks for reading, also! Glad you liked it. None of the material contained within this site may be reproduced in any conceivable fashion without permission from the author(s) of said material. This site is not sponsored or endorsed by Nintendo, Sega, Sony, Microsoft, or any other such party. Pu-Li-Ru-La is a registered trademark of its copyright holder. This site makes no claim to Pu-Li-Ru-La, its characters, screenshots, artwork, music, or any intellectual property contained within. Opinions expressed on this site do not necessarily represent the opinion of site staff or sponsors. Staff and freelance reviews are typically written based on time spent with a retail review copy or review key for the game that is provided by its publisher.